I was referring to the connector described by b3lha (Phil) in the interface build instructions. I hadn't noticed your (SVXdc) connector pictures, which do have different colored wires. Now that I have, I can't see which goes where well enough to translate. Perhaps you could do it? y'all lost me at " Memory Dump of ECU "
92 ebony 4.44's rock !! I was referring to the connector described by b3lha (Phil) ... I can't see which goes where well enough to translate. Perhaps you could do it? Ah, I read through Phil's doc again and see now. You both were indeed talking about the colors on the audio harness Phil found. Very odd color scheme — not the EIA standard found on most car radio harnesses today. View is looking at the contact pins on the CAR'S harness (wires pointing away from you). On the aftermarket harness, this would be the side with the wires pointing towards you, pins pointing away. As I suggested earlier, since you're going to extract the unneeded wires anyway, you might as well transplant the Red and Black wires from the 7-pin connector into pins 5 and 9, respectively. The attachment to this post is the same gif as above, in case the link goes bad. Drawing courtesy of NASIOC's vrg3, on this page that shows the entire pin-out of the radio connectors. View is looking at the contact pins (wires pointing away from you). Just so you know, I did swap in the red and black wires on the first one I made. I didn't do it for the second one because I didn't want to the complicate the HOWTO. These things are really easy to make. It takes me about two hours now I know how to do it. Look at the second and third items on the page. I'm not sure about the USB device. The PC will see it as a serial port, but it's not a standard 16550A. You might have to modify the software to set the baud rate correctly. Last edited by b3lha; 04-29-2007 at 03:02 AM. Now this is a good thread! Thanks for pointing that out. I've edited my previous post to be a little more clear. Great write up. Just wondering what program you use to run the linux version software? It's C source code, tarred and gzipped. You extract it with "tar -xzvf filename.tar.gz" and then run "make" to compile it. ecudump.c compiles to an executable called ecudump. When you run ecudump, it calls the functions in ssm.o to extract data from the ECU and write it to a file. If/when I've worked out enough of the memory locations in the ECU I'll write something to display them graphically in real time. If you know how to program, then you can write your own software to call the ssm functions and display the data however you want it. Last edited by b3lha; 04-29-2007 at 10:01 AM. I got some emails that people have been trying to PM me but my mailbox was full. I've cleared some space now. You can also email me at b3lha alcyone org uk. just want to keep track of this posting as I understand assembly so this might be something I can play with later. 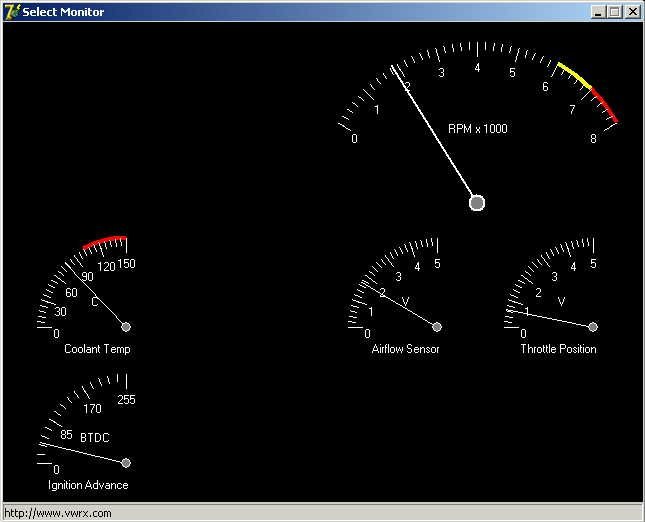 So far I've had good results doing this on my 94 SVX Version S40ii and my 96 Legacy. I've just discovered that it doesn't work on my 91 SVX Version L.
It connects OK and the ECU does respond to the commands I send. But the data it sends back does not conform to the protocol. The response is different every time I run the command . It looks random. I thought maybe my ECU had a faulty transmitter, so I tried it on another 91 Version L - and that one does exactly the same thing! Maybe the early cars use a different protocol. Maybe it's just the 4WS cars. Maybe they are actually both faulty in the same way. Could be a bug in the early CPUs. At some point I'll investigate further. For now I'm going to concentrate on figuring out the assembly code. I've already found a few interesting routines, but it's slow and time-consuming work. I'll post some updates on my website when I have enough information to make it worthwhile. I took a couple of screenshots of the software running on my 94 SVX. 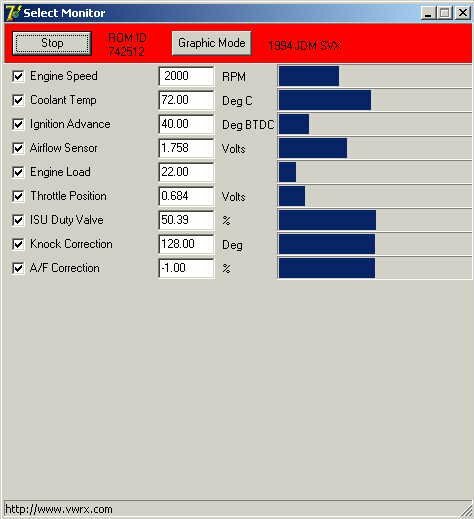 Could one of the engine gurus please comment on whether the data looks correct? Last edited by b3lha; 05-13-2007 at 04:36 PM. Any chance we could get some pictures large enough to read?